If you're creating a Multiple Response, Single Response, or Dropdown form field question that you know will have a long list of potential response choices - such as a list of states, countries, or professions - you can upload a prepared list of choices as a .CSV or .XLSX spreadsheet. 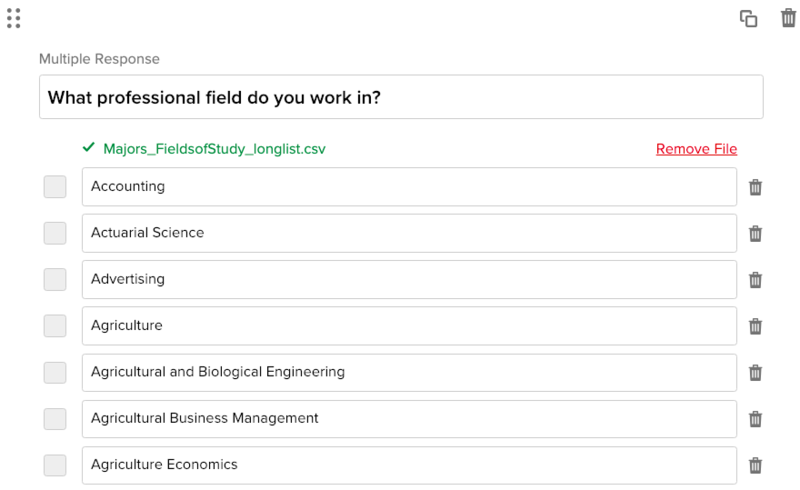 For example, it you're going to ask your applicants what profession they currently work in, you can create an Excel spread sheet with a long list of options, then upload this list into a drop down or multiple response field, so that each field in your spreadsheet list becomes a potential response for the question. Dropdown List - Creates a list of response choices of any length that is viewed as a dropdown when clicked. The dropdown list helps save space in your form. Single Checkbox - Provides a single checkbox accompanied with a textual statement. This form field is often used for something to ask submitters to acknowledge a stated condition by checking the box. 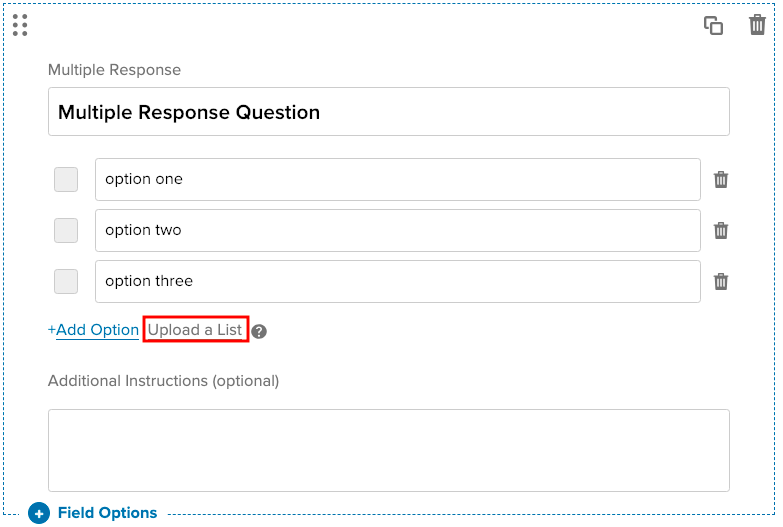 Multiple Response - Enables the creation of a list of choices, from which an applicant or submitter can choose one or more of the answers provided. At the bottom of the 3 default option fields, click on Upload a List. Select a prepared list from your computer files. Here is an example of what a long list spreadsheet might look like in Excel. This one is for professions. Once the .CSV or .XLSX file has uploaded, the selections in the spreadsheet will populate the list.